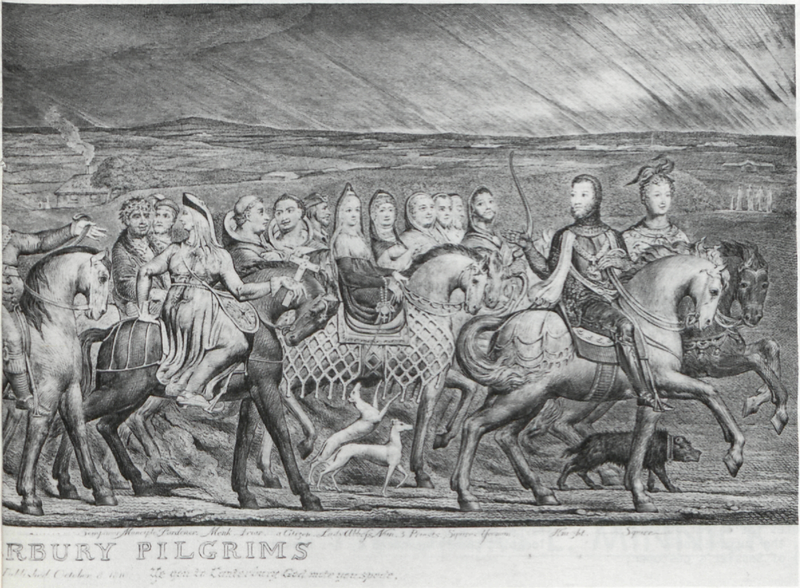 Blake’s etching-engraving, “Chaucers Canterbury Pilgrims,” is by far the largest plate he ever executed. His writings about the design, including a long entry on the tempera painting in A Descriptive Catalogue of 1809, two prospectuses for the plate (May, 1809 and c. 1810), and several passages in the Public Address of c. 1810, testify to the importance the artist himself placed on this work. The early history of the project, which attracted the attention and duplicitous instincts of Robert Hartley Cromek, is a well-known episode in Blake’s biography.1↤ 1 The various sources of this story differ in the degree of culpability they assign to Cromek and the role (probably innocent) Thomas Stothard played in the affair. See John Thomas Smith, Nollekens and His Times (London: Henry Colburn, 1828), II, 467-71; Allan Cunningham, The Lives of the Most Eminent British Painters, Sculptors, and Architects, Second Edition (London: John Murray, 1830), II, 163; John Linnell’s reaction to Smith’s account, reprinted in G. E. Bentley, Jr., Blake Records (Oxford: Clarendon Press, 1969), p. 464 n. 1; Alexander Gilchrist, Life of William Blake (London: Macmillan, 1863), I, 203-205, 223; Mrs. [A. E.] Bray, Life of Thomas Stothard (London: John Murray, 1851), p. 130. Cromek’s self-serving version of the story is given in the “Biographical Sketch of Robert Hartley Cromek,” in Robert Blair, The Grave (London: R. Ackermann, 1813), p. xlviii. But little attention has been given to the history of the copperplate (see illustration) after Blake’s death in 1827. New information has recently come to light concerning the many posthumous impressions taken from it, particularly those pulled when the plate came to America. Some of this information suggests that the plate’s latter-day history, like its beginning, is in part a story of questionable business practices. According to Henry Crabb Robinson, the “print of Chaucers pilgrimage” belonged to Mrs. Blake in January 1828.2↤ 2 Bentley, Blake Records, p. 362. By this he probably meant that the copperplate and impressions still in stock were part of Blake’s estate that passed to his wife. After Mrs. Blake’s death in 1831, the plate may have passed to Frederick Tatham (died 1878), although there is no direct record of his ownership or use of the plate. At an unknown time, probably in the 1860s or 1870s, the plate was seen in a “shop window” by John Giles, Samuel Palmer’s cousin and a friend of George Richmond’s, and was purchased by Giles “for the rapturous ‘old song’ so dear to the true Londoner of those days of amazing bargains.”3↤ 3 According to A. H. Palmer (Samuel’s son) in his “Princess” Notebook No. 7, p. 352, now in the collection of Miss Joan Linnell Ivimy. We are grateful to Raymond Lister for this information, first noted in part in his Samuel Palmer, A Biography (London: Faber and Faber, 1974), p. 52. The approximate dating is Mr. Lister’s suggestion. Giles died in 1880 and the plate was sold with his collection at Christie’s in London, 4 February 1881, lot 483, described in the auction catalogue as “Chaucer’s Canterbury Pilgrims, by W. Blake; and the engraved steel [sic] plate.” The lot was purchased for £35 by the London art dealer Colnaghi who, according to a brief announcement in Notes and Queries of 1881, had an unnamed number of impressions printed from it “on Japanese paper” (i.e., laid India).4↤ 4 6th series, 3 (5 March 1881), 200. The present firm of P. & D. Colnaghi & Co. has no records of the number of impressions taken or over how long a period the plate was used. All of these Colnaghi prints are of course in the final state and can be identified by the fact that they are on India paper laid on to thick wove and are rather flatly printed, as though the plate had not been sufficiently cleaned of old ink or not thoroughly inked for the new printing.5↤ 5 The complete cleaning of an old copperplate, etched and engraved in intaglio, is a laborious task. All the solidified ink deposited from previous printings must be removed from each line. Most of those impressions probably printed by Colnaghi bear all the hallmarks of pulls from an improperly cleaned plate. We have been able to locate six impressions on laid India which are very probably Colnaghi restrikes. These are in the collections of Maxine S. Cronbach (Westbury, New York), Donald A. Heald (London), Mills College (Oakland, California), the National Gallery of Canada (Ottawa), Jeremy M. Norman (San Francisco), and the University of Texas (Austin). There are no doubt a good many more Colnaghi restrikes;6↤ 6 In recent years, Colnaghi restrikes (now untraced) have been offered for sale by Craddock & Barnard of London, October 1959 catalogue no. 93, item 50 (£50—perhaps the impression purchased by Craddock & Barnard at Sotheby’s, 22 January 1958, lot 52, for £24); by the same dealer in their November 1965 catalogue, item 249 (£120); and by Colnaghi, November-December 1972 catalogue, Original Printmaking in Britain 1600-1900, item 127 (£120). and several impressions on wove or laid paper, including the one in the New York Public Library, may also have been pulled by that firm as part of another printing with better inking. Indeed, any impression of the final state of the plate may be a posthumous print unless there is documentary evidence to the contrary. The copperplate next passed into the hands of the New York dealer Gabriel Wells no later than April 1940. Early in that month, William Hobart Royce, one of Wells’ representatives, sold the plate to Mrs. A. Edward Newton, who presented it to her husband on their fiftieth wedding, anniversary, 7 April 1940.7↤ 7 The story of this purchase is recounted in the Parke-Bernet sale catalogue of the A. E. Newton collection, I, 77. After Newton’s death, it was sold with his great book collection at Parke-Bernet, New York, on 16 April 1941, lot 150. The plate was purchased by the Philadelphia book and print dealer Charles Sessler for $2,300, plus the usual 10% agent’s commission, on behalf of Charles J. Rosenbloom of Pittsburgh.8↤ 8 According to Sessler’s sales records. This and all other Sessler records presented here were discovered by Michael Young during the course of research towards Robert Essick’s forthcoming catalogue of Blake’s separate plates. These records consist of one hundred drawers of inventory cards kept by Sessler’s firm from 1903 to the present; each card notes the object, Sessler’s source, price and date of acquisition, the surname (only occasionally the initials or forename) of Sessler’s customer, the date of sale, and the sale price. Further information exists in the Sessler archives on deposit with the Historical Society of Pennsylvania, Philadelphia. That collection remains, at the date of this writing (February 1981), closed to public inspection. But before the physical transfer of the copperplate to Rosenbloom, Sessler hired a printer to pull a new group of impressions. According to Geoffrey Keynes in his catalogue of Blake’s separate plates, Sessler had “thirty-five proofs pulled on French hand-made paper (Rives) by Ernest D. Roth under the supervision of James McBey; these were sold for $35.00 each. An impression was also printed on Chinese silk for a lamp-shade.”9↤ 9 Engravings by William Blake: The Separate Plates (Dublin: Emery Walker, 1956), p. 48. Keynes’ account is based on information supplied by Mabel Zahn,10↤ 10 According to Keynes in conversation with Robert Essick, August 1979. for many years the manager of Sessler’s antiquarian book and print department and something of a legendary figure among collectors. That the new owner of the plate knew about and approved of a press run of thirty-five is indicated by Rosenbloom’s receipt (according to Sessler’s records) of $175 on 25 June 1941, representing a five-dollar commission or permission fee for each of thirty-five prints. Keynes’ figure of thirty-five impressions (discounting for a moment the one on silk) thus corresponds exactly to the number for which Rosenbloom received payment, but a census taken directly from Sessler’s inventory cards indicates that in fact at least ninety-one impressions were pulled. The printer, Roth, received payment for his work totaling $440.50 in five installments: $200 on 15 May 1941, for forty prints at $5 each; $85.50 on 28 May 1941, for nineteen prints at $4.50 each; $45 on 18 June 1941, for ten prints at $4.50 each; $90 on 2 July 1941, for eighteen prints (on silk) at $5 each; and $20 on 14 February 1942, for four prints at $5 each. All impressions for which Rosenbloom received his fee were pulled in the first group for which Roth was paid, independent of their eventual price or date of sale. Since Sessler’s records indicate dates of payment, not the physical transfer of goods or time printing was completed, it is possible that the plate was delivered to Rosenbloom long before the final payment was made to Roth in February 1942. It would take an unusually patient collector to allow his agent to keep a beautiful work of art purchased at auction for as long as ten months. Sessler’s sales records of their “Canterbury Pilgrims” restrikes are summarized in the following chronological list of purchasers. The total of ninety-one impressions does not include the resale of returned prints or the one sold on consignment by an earlier purchaser. Sales for which Rosenbloom was paid a commission are indicated by an asterisk following the price for each impression. 24 April 1941: Beadle, $35, returned 4 November 1941, resold Robinson, $50, 9 June 1942, returned 22 July 1942, resold Plaza, $23, 4 April 1944. 2 May 1941: Gerstley, $35. * 3 May 1941: Borneman, $35* (sold from Borneman’s collection at a Parke-Bernet auction, New York, 1 November 1955, lot 231—no record of price or purchaser available). 10 May 1941: Goodspeed, $20. * 12 May 1941: Harlow Keppel, $20*; McDonald, three at $20 each***; Thomas, $35. * 14 May 1941: Neilson, $35. * 15 May 1941: Kidd, $20. 19 May 1941: Newton,11↤ 11 Possibly Caroline Newton, daughter of A. E. Newton. five at $35 each*****; Hill, $20*; Wells, $20, returned 10 June 1941; Mayer, $20*; Keppel, three at $20 each***. 26 May 1941: Rosenfeld, $35*. 7 June 1941: Wells, two at $20 each. 27 June 1941: Cox, twelve on silk at $20 each. 1 July 1940 [error for 1941]: Shapiro, $20. 8 July 1941: Schapiro, three at $20 each***, one at $35; Levering, $20, returned 17 July 1941, resold Newton, 12 February 1946, $35. 9 July 1941: Schapiro, $20. 11 July 1941: A. Rosenbloom, $35. 16 July 1941: Cox, two at $20 each**. 14 August 1941: Burr, $35. 25 August 1941: Peck, $35. * 8 September 1941: Doubleday Doran, two at $35 each, returned 21 October 1941, one resold Holman, $20, 12 December 1941, the other resold Knoedler, $20, 25 September 1942. 8 October 1941: Sterne, $35. 4 November 1941: Russell, $50. 25 November 1941: Doubleday Doran, $20.75. 29 November 1941: Knoedler, $20. * 14 February 1942: Cox, four at $10 each. 24 April 1942: Cox, six on silk at $12.50 each. 31 October 1942: Serinson, $20. 20 January 1943: Mt. Holyoke, $20. * 4 February 1943: Castle, $35. * 29 December 1943: Kelleher, $25. * 21 April 1944: Jennson, $20. 27 April 1944: Duschnes, $20. * 12 May 1944: Harlow and Co., $20, returned 22 May 1944, resold Arthur H. Harlow, 10 February 1947, $20. * 24 May 1944: Duschnes, $20. 5 June 1944: Duschnes, $20. 11 December 1944: Shapiro, $20. * 13 May 1944: Wilson College, $23.50. * 6 January 1945: Duschnes, $20. 12 April 1945: Kleeman, $20. 12 February 1946: Newton, $35. 13 August 1946: Closson, $20, returned 13 September 1946, resold Freeman, 4 February 1947, $9.35. 4 November 1946: Shapiro, $20. 21 November 1946: Richard Ellis, $45. Undated but grouped with 1946 records: Shapiro, $20. 25 April 1947: cash purchase, $35. 19 January 1948: Jones, $35*, repurchased for $15 on 9 December 1954, resold same day, Duschnes, $35. 17 April 1948: Knoedler, $20. 14 December 1948: Woodruff, $35. 10 February 1949: Parke-Bernet, $46.80. 12 November 1949: cash purchase, $35. 28 April 1950: Chiswick, $35. 15 May 1953: C. C. Savage, $35. 29 August 1967: a restrike on consignment from Park (not one of the original purchasers) at $35 sold to Frye, $65. William Blake, “Chaucers Canterbury Pilgrims.” Photograph of the copperplate with the negative reversed so that the image appears right way around (as in an impression from the plate). Image 30.55 (left side) to 30.65 (middle) to 30.5 (right side) × 94.9 cm. ; plate 35.6 (left side) to 35.8 (right side) × 97.05 cm. Reproduced by permission of the Yale University Art Gallery. Bequest of Charles J. Rosenbloom, B.A. 1920. Lande, who gave it to McGill University, Montreal, in 1953.13↤ 13 The McGill impression is reproduced in Eighteenth-Century Studies, 12 (1979), facing p. 490. We thank Professor Christopher Heppner for his assistance with the McGill collection. Staunton P. Peck gave the impression he purchased on 25 August 1941 to the Philadelphia Museum of Art in the same year; the example given to the Princeton University Library by Miss Caroline Newton is probably one of the seven purchased by “Newton” (19 May 1941 and 12 February 1946). We have not been able to discover the original purchaser of the impression in Robert Essick’s collection he acquired in 1972 from the estate of the Hollywood character actor Thomas Gomez. The impression recently bequeathed to the Brotherton Library, University of Leeds, by Ruthven Todd was given to Todd by Charles Sessler in 1947.14↤ 14 According to Todd, “A Tentative Note on the Economics of The Canterbury Pilgrims,” Blake: An Illustrated Quarterly, 11 (1977), 31. There is of course no record of this gift in Sessler’s sales accounts; the impression may have been an additional, ninety-second restrike or the one returned by “Wells” on 10 June 1941 and not resold. The present firm of Sessler’s no longer has any impressions in stock, but there are surely other restrikes still extant. Many of the original sales were to dealers-Goodspeed of Boston, Wells, Doubleday Doran, Knoedler, Duschnes, Parke-Bernet, and probably others—and these were no doubt sold to a variety of private customers in the 1940s. 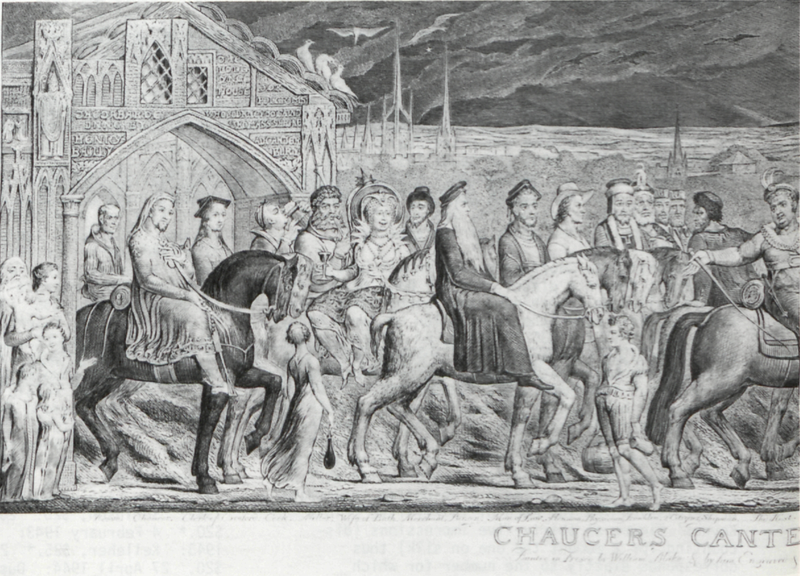 Because of the Colnaghi and Sessler reprintings and sales, “Chaucers Canterbury Pilgrims” exists in more impressions than any other separate plate designed and executed by Blake. The eighteen impressions taken on silk were fated to become ornamental curiosities. All were purchased by Warren E. Cox, a collector of and dealer in porcelains, who, soon after his purchases of 27 June 1941 and 24 April 1942, offered for sale lamps featuring “Canterbury Pilgrims” shades. The book dealer John Fleming purchased one in the 1940s for the antique dealer Philip Rosenbach for $500; he recalls that some twelve were offered at that time for the same price.15↤ 15 According to Mr. Fleming during a telephone conversation with Michael Young, 15 July 1980. The high price may have been due to the base of the lamp, not the shade. We are grateful to Mr. Fleming for the information recorded here about the lampshades. That lamp has since passed into Fleming’s private collection in New York; another is owned by Charles Rosenbloom’s widow, Lucile Johnson Rosenbloom, of Pittsburgh. We have not been able to locate any further examples. The shade owned by Mrs. Rosenbloom is now rather browned and warped by the heat of the lamp; perhaps other “Canterbury” shades have been nicely toasted by excessive wattage. Whereas most of the identifiable Colnaghi restrikes were flatly printed, the Sessler prints begin page 81 | ↑ back to top were heavily inked and printed. The plate shows minimal wear and the Sessler prints are generally preferable to Colnaghi’s earlier printings—probably because of better cleaning of the copper and superior presswork. Because of framing and glazing, we have been able to check for watermarks only in the Sessler impressions now owned by Robert Essick, Mount Holyoke College,16↤ 16 We are thankful to Anne C. Edmunds of Mount Holyoke College for checking the watermark for us. and the Philadelphia Museum of Art. These three show a “FRANCE” watermark in the lower right corner. This is no doubt the “French hand-made paper (Rives)” noted by Keynes. The other Sessler restrikes we have seen appear to be on the same rather soft, easily stained, but good quality wove paper; it seems likely that Roth printed all but the eighteen silk impressions on this paper manufactured by Rives. The fact that Rosenbloom was paid a commission for only thirty-five Sessler restrikes, and that Mabel Zahn told Keynes that only that number was printed (plus one on silk), suggests that the further fifty-six prints recorded in Sessler’s sales records were not authorized by the owner of the copperplate. Zahn certainly knew that more than thirty-five impressions were taken from the plate, but may have avoided telling Keynes of this in order to prevent the plate’s owner from learning the truth. That Zahn told Keynes about only one impression on silk—thus accounting for the lampshade in Rosenbloom’s possession—is particularly suspicious. The evidence presented by Sessler’s sales records hardly constitutes legal proof of fraud, but the possibility exists that Sessler or his employees acquired a good many more impressions than Mr. Rosenbloom authorized, or was paid for, or was told about.17↤ 17 We wish to acknowledge the cooperation of the present management of Charles Sessler, Bookseller, and to state publicly that any questionable practices revealed by the Sessler sales records in no way reflects on the conduct or character of the present firm, its owner or employees. We wish also to thank Sir Geoffrey Keynes for his invaluable assistance and G. E. Bentley, Jr., for locating the print owned by Mr. Gerstley. In October 1973, Mr. Rosenbloom bequeathed the much travelled copperplate of “Chaucers Canterbury Pilgrims” to the Yale University Art Gallery, New Haven, Connecticut. The copper has crystalized, as is to be expected, but the plate is in good condition and shows little evidence of wear and no damage. The incised lines are thoroughly clogged with old, solidified ink, but if properly cleaned the plate could certainly yield acceptable impressions. Fortunately, the present location of the plate in a responsible university collection makes future printings unlikely and should prevent its unauthorized use in the pursuit of profit. After such a long and difficult pilgrimage, “Chaucers Canterbury Pilgrims” deserves a respectable retirement.